MSI has introduced the PR200 Crystal Collection 12.1-inch luxury notebook, which features 120 handcrafted crystals forming a ring on notebook’s lid, and a pearl white chassis color. 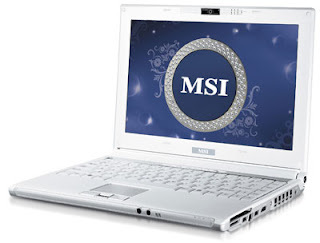 The 'simple, sophisticated and elegant' MSI PR200 Crystal Collection 3.9-pound ultraportable is based on the Intel “Santa Rosa” mobile platform and combines the Intel GM965 chipset and an Intel Core 2 Duo processor. The Graphics Media Accelerator X3100 integrated GPU manages the notebook’s 12.1″ “Amazing Crystal Vision” display with 1280×800 resolution. This fashionable laptop supports up to 3GB of system memory and comes with a hard drive up to 250GB and a DVD burner. Regarding communications, the PR200 Crystal Collection has a wireless module supporting 802.11n draft standard, a Gigabit Ethernet port, a 56K modem, and an optional Bluetooth receiver. In addition, it has a built-in 1.3-megapixel web camera. The laptop features a HDMI output, a VGA port, three USB ports, an ExpressCard slot, and a 4-in-1 media card reader. MSI also provides an optional TV tuner built into this small notebook. The PR200 Crystal Collection runs Windows Vista Home Premium operating system. Its pricing and availability date are unknown currently.